Founder Member, Maharaja Agrasen Sewa Sansthan, Pathalogical Lab, X-Ray, Ultra Sound, E.C.G. etc. on not-for-profit basis. Chief Organiser, Delhi-UP Border Shiv Kanwad Samiti which is the most popular camp for Kanwad Yatris in Delhi. Chief Advisor of Maharaja Agrasen Sewa Sangh which provides ambulance service and hearse service to general public on not-for-profit basis. Educational Qualification :- B.A. from Hans Raj College of Delhi University. 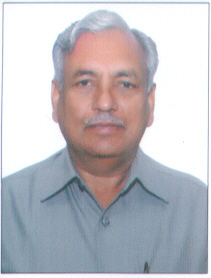 Shri Ram Niwas Goel was elected as MLA in the First Legislative Assembly of NCT of Delhi (1993-98). Thereafter he has been elected as Member of Sixth Legislative Assembly from Shahdara Assembly Constituency. He was elected as Speaker Delhi Legislative Assembly on 23-02-2015. Countries visited : China, Sri Lanka, Singapore, U.K.
Office : Room No. 59, Vidhan Sabha, Old Secretariat, Delhi-110054. Residence : 9, Sham Nath Marg, Delhi - 110054.